You are here: Home / Where To Learn Brazilian Portuguese For BJJ? 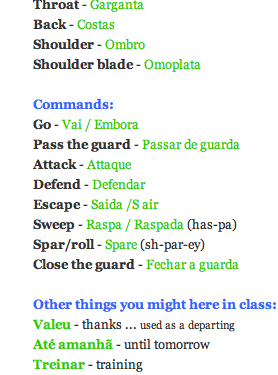 To learn Brazilian Portuguese as a BJJ player might be some kind of final frontier. A number of BJJ players I’ve known have taken an interest in Brazilian Portuguese, and traveling to Brazil to the source, somewhere around brown belt. With the coming trip to Brazil to train BJJ with Pedro Sauer for 10 days as our honeymoon (ain’t I lucky??? ), I sought out some resources for learning Brazilian Portuguese. – Nao fiz nada de errado. – Para onde me levam? – Posso pagar uma fianca ja? 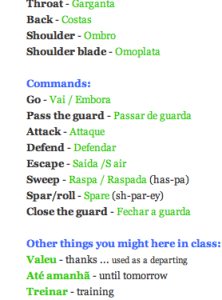 Here I found all the Portuguese Brazilian terminology I was hoping to find, as a BJJ player. Body parts, names of moves, positions, common classroom commands, belt colors, etc. I hoped I would find a resource basically exactly like this one. It isn’t enough, but it really actually might be enough to make it through a class with some understanding of the instruction, and a novice ability to describe what you are doing or asking. Something else that would be a good supplement, here, would be watching some un-translated jiu jitsu instructional videos in Brazilian. I learned a lot as an exchange student in Spain by immersing myself in Spanish television. 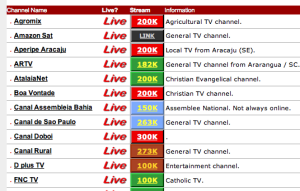 At this website you can choose from dozens of channels playing television programming in which Brazilian Portuguese is spoken. 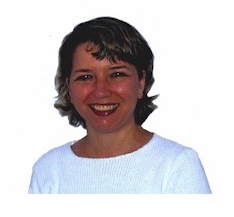 This is a comprehensive website with many approaches to teaching Brazilian Portuguese, and many nooks and crannies worth exploring. For example, there is a page dedicated to confusing and confusable words in which Sonia helps to disambiguate through examples of use. I haven’t even fully explored this website, as there is so much there. Definitely worth a look. Another list like the one on Dirty White Gi BJJ Vocab List (which I believe was in part assembled from here). By the way, this website is an amazing resource. Explore it when you get a chance! This is a podcast from which you can gain practice in listening to spoken Brazilian Portuguese, and have it compared with Spanish. Line by line, a dialogue is repeated in Spanish after hearing it in Brazilian. As a musician, I have a great appreciation for very subtle differences in sounds, and love the challenge of learning to make the sounds a native speaker does. With a background in Spanish, it is normal, and likely, that I could fall into Spanish pronunciation, so I this site is helpful in helping tackle that, head on. This is a listing of useful resources for those on a quest similar to mine to better understand the culture and language of Brazil. 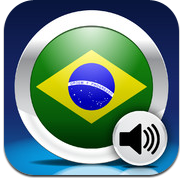 This list of links includes resources to better use translation software, a phone directory for Brazil, tourism and travel info, and even how to make your keyboard create the accented characters necessary to type proper Portuguese. Actually, I’m going to use this to learn Portuguese later. I think this website will be good to increase my vocabulary, disambiguate conjugations, and deepen my understanding of what I’ve learned from a beginner’s audio course first. This is where I am really focused as a beginner. The lessons are 30 minute audio tutorials, perfect for my morning commute, when I am alert and eager. There is a lot of listening and repeating back, which I find perfect for my initial desire to get a feel for the accent. I am up to lesson 10, and am enjoying the program a great deal so far. I do know that I’m learning a dialect more “proper” than most Brazilians likely speak to each other informally, but it is a great starting place. Thankfully I found a copy of this course to borrow, rather than paying for it new, but am linking here to the original content, and am more appreciative of my copy now that I see the price! This app is awesome! I paid for the full version. Again, it speaks, and allows you to mimic the accent you hear. It has tons of useful phrases, and something is even better about being able to repeatedly hear a phrase on demand (not wait for it on a recording). All is downloaded to the phone, so will still be available to me, once abroad. I can even imagine pressing buttons and letting my phone do my speaking, in a moment of a native speaker not deciphering my gringo attempt at a phrase. I learn best from flashcards, generally, so the flashcard section is indispensible. As a BJJ player, I also appreciate the “parts of the body” section. It’s also fun to play with the section of the app in which you are recorded speaking, and can compare it to a native speaker. I was surprised to find a great deal of helpful info online. 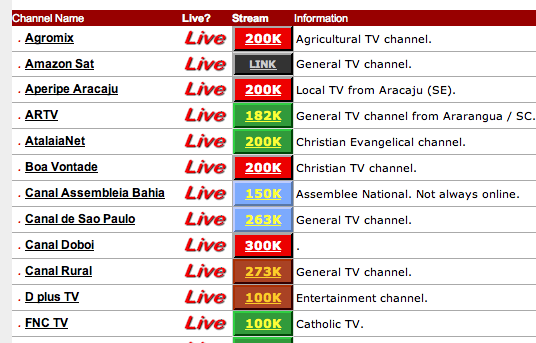 This is probably something of a hot topic, with the olympic games coming up in Brazil in 2014.